For the first time in two years we'll have an orthodox, full-length NBA season to look forward to. No lockout nonsense, and precious little obsession as to whether or not LeBron James will ever win the big one. He's won it, already, and our sanity as NBA followers is probably better off as a result. However big that shred of sanity is remains to be seen, following yet another offseason that once again proved that the NBA is full of Crazy McCrazytons that appear to take great delight in messing with us continually. As a result of that offseason, and the impending regular season, why not mess with Ball Don't Lie's triptych of Kelly Dwyer, Dan Devine and Eric Freeman as they preview the 2012-13 season with alacrity, good cheer, and bad jokes. 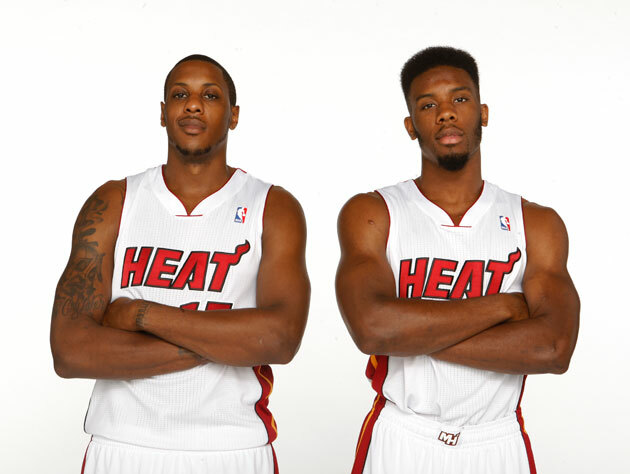 We continue with everyone's favorite, the Miami Heat. Six games. That's what kills me about the Miami Heat. The team made it to the Finals in 2011 and played very good basketball for most of the 2011-12 regular season, but we're basing nearly eight months of expected NBA basketball between now and late June (when, presumably, the Heat will repeat as NBA champions) on six games of ball from last summer. Six scary, dominant, frightening displays of brilliant basketball. Six games worth fearing, if you're a fan of the other 29. Six games warming to fans of great basketball, fans that don't care if the Heat win or lose it all but still want to see legendary players work at peak efficiency. Six games — starting with Game 6 of the Eastern conference finals, and moving along toward to the end of Miami's championship season while excluding Game 1 of the NBA Finals. Six games that saw LeBron James act as a dominant scorer first, unashamed and not embarrassed by how quickly and seemingly effortlessly he turned opposing defenses into a junior varsity-resembling mess. The same immediacy, worked through with economy and precision in ways we'd been begging for since his Cleveland Cavaliers squandered a 3-2 series lead against the Detroit Pistons in 2006 because he predictably tried to attack the defense from the great beyond. That championship stretch, paired with his all-around brilliance during last summer's Olympics, have most of us assuming that the Heat will dominate the NBA once more; especially now that LeBron understands that the low post is something to warm to, instead of shy away from. The Bulls are battered, the Celtics and Spurs too old, the Lakers can't defend and the Thunder couldn't even take a second game from the Heat last June. Why can't Miami romp, again? Frankly, there only thing standing in the way of a romp through the 2012-13 regular season and postseason is the same thing that got in the team's way in 2011, and for parts of the squad's 2011-12 run. It's on James, again leading this top-heavy team with some of the more lacking rotation role players in the game (much less amongst championship contenders), spinning quickly and working from the inside-out. Scoring, and only passing when it becomes apparent that he has no other option but to dish; as was the case when James racked up 25 total assists in the fourth and fifth game of last season's Finals. Stuck with a payroll that nearly hands the entire soft salary cap to Mssrs. James, Wade and Bosh, the Heat more or less stood pat over the offseason outside of adding Ray Allen and Rashard Lewis to that mix. Attempts at securing a passable center were ignored. The search for a typical past-first point guard was called off. Even Allen and Lewis — legendary and at worst lights-out shooters in their primes — have to be considered an afterthought. Wade may limp all season. Bosh is a well-meaning afterthought, fighting for scraps. James? As it was in Cleveland, with those lesser lights, he'll be the focus. The name recognition and all-NBA talents of Wade and Bosh hardly matter — it is James that is going to have dominate in a scoring sense, forcing defenses to collapse and calling his own number amongst a phalanx of flailing arms, knowing that an interior look from eight feed away over a double-team may often be preferable to an elbow-extended three-pointer from an NBA-famous name (Lewis, Shane Battier, James Jones, Bosh, Mike Miller, even Ray Allen at times). LeBron doesn't have to treat every winter Wednesday like it's late May, but he does have to do it often enough to keep the touch and timing down in preparation for what again will be a hellacious postseason title defense. The East has weakened, there should be no doubt, but even an improving Heat squad will have a devil of a time getting out of its local bracket if James isn't getting to the line and losing the 1-against-5-from-25-feet-away sets that made his playoff failures from 2006 to 2011 so easy to predict. Apologies for making this into a star turn, focusing on the biggest name above all, but even as a part of a famous triptych James is the influence that keeps this top-heavy experiment afloat. That quickness, and that attention to detail, has to sustain. He can't be embarrassed by his own strength. Clearly, we don't think he will be. 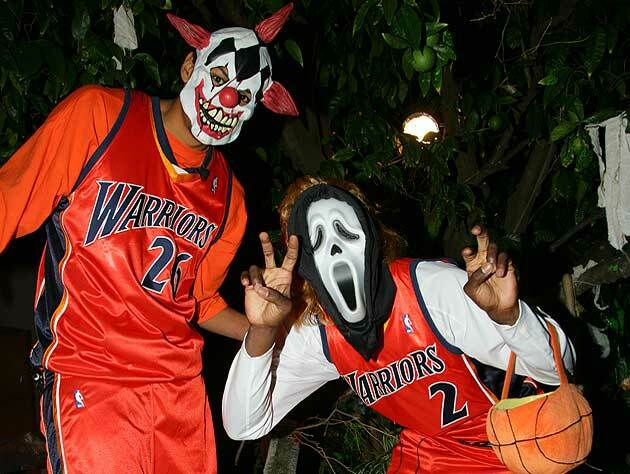 It is tonally appropriate that the NBA season tips off just before Halloween -- because on any given night, each and every one of the league's 30 teams can look downright frightening. Sometimes, that means your favorite team will act as their opposition's personal Freddy Krueger; sometimes, you will be the one suffering through the living nightmare. In preparation for Opening Night, BDL's Dan Devine considers what makes your team scary and what should make you scared. What Makes You Scary: Prime LeBron James and the (pretty good) chance that this year's team will be better than last year's. The Heat weren't overwhelming last year, but still had an excellent season. (Given the title run, this might seem like an understatement, but bear with me.) They turned in the league's fourth-stingiest defense and one of its eight most efficient offenses -- both Hoopdata and NBA.com's stat tool put Miami at No. 6, while Basketball-Reference.com pegs them at No. 8 -- and lost more than two consecutive games just twice in 89 total regular- and postseason contests. They stumbled at times, trailing in three of their four postseason series, but came back each time. They weren't the league's most dominant offense (either OKC or the San Antonio Spurs) or its most suffocating defense (either Boston or the Chicago Bulls). But all told, they were its best, most balanced team, and its champions. -- They will again feature the league's most dominant force, only this time he's coming off the greatest year of his life, has shed any "never won the big one" pressure and, at age 27, is likely entering the peak of his prime. The Heat have won 70 percent of their games, two Eastern Conference titles and one NBA title over the past two years, all while mostly just sort of figuring things out. Now, they know what they are: A high-octane offense that generates mismatches and openings through spacing, forces you to respond, targets its talent down low when you do and strokes open 3-pointers in the corners if you don't. That's how they finished last year, and with LeBron James preparing to spend a lot of time down low, Chris Bosh making the full-time move to the five and Shane Battier reportedly slotting into the starting frontcourt alongside them, that's how they're starting this one. This is a good idea, because the five-man unit that logged the most playoff minutes for Miami -- Bosh, James, Battier, Dwyane Wade and Mario Chalmers -- blew away the competition, outscoring their opponents by an average of 10.5 points per 100 possessions in 160 minutes of floor time, according to NBA.com's stat tool. And I do mean "outscored" -- despite facing four teams that finished among the top 10 in the league in defensive efficiency during the regular season, those five rang up 112.3 points-per-100 in the playoffs, a mark that far outstripped the team's regular-season averages and would have in fact led the NBA in offensive efficiency. Swap in reserve bigs Udonis Haslem (111.8-per-100) and Joel Anthony (111.2-per-100) and the offensive numbers stay awesome without a precipitous slide on D, supporting the theory that one big who can rebound and defend, three wings who can shoot, and one LeBron who can do anything equals a pretty solid recipe for success. There is some conflicting data -- swap in the since-departed Ronny Turiaf and the offensive efficiency dropped to sub-Bobcats level (89.6-per-100 in 66 minutes), lineups in which other wings replace Wade are less appealing and the standard "small sample size alert" caveats apply -- but on balance, this looks like a recipe for creating potent, versatile, offensively dominant and defensively sound lineups. And Miami's offseason acquisitions -- all-time 3-point king Ray Allen, stretch four Rashard Lewis, floor-spacing five Josh Harrellson -- fit the scheme perfectly. Miami attempted 15.6 3-pointers per game during last regular season, eighth-fewest in the NBA; that went up to 19.7 per game in the playoffs, fourth highest among playoff teams (second once you weed out teams that didn't last a round). That number will go up this year, as Miami's weapons create and exploit all those too-open looks, and with all that shooting around all those stars, that's got to have opposing coaches losing sleep. They'll leave the 73-9 predictions to others, but make no mistake: the Heat are the favorite to take this year's title, too. What Should Make You Scared: Injury, overreliance and a rising tide. As was the case in each of the last two seasons, the Heat enter the season with relatively little depth behind their stars, especially up front behind Bosh and James, where both Haslem and Anthony looked highly shaky much of last season and Lewis has looked cooked for nearly two years. If injuries again rear their ugly head -- Bosh with his rehabbed abdominal muscle, Wade with his surgically repaired left knee, Allen with his surgically cleaned-up right ankle, Mike Miller with his not-surgically-repaired back -- the burden on James will grow exponentially. Of course, given Miami's likely plan to run him at something approximating point-power-forward in that mutant small-ball lineup, as it did throughout his epic postseason run, that burden will already be pretty massive. During the playoffs, when LeBron became the do-everything game-dominator for whom fans have long fiended, he averaged nearly 43 minutes a night, saw time playing all five positions on both ends of the floor, routinely checked the opposition's best scorer and led the Heat in points, rebounds, assists and steals. Even with James at the peak of his powers, can Miami ask him to be that all-encompassing guy again, for a full 82-game season plus the playoffs (after last year's title run, plus summer duty with Team USA), without some slippage or breakdown? If he does drop off, even a bit, that could be enough for the handful of teams likely to provide their stiffest competition for this year's title -- many of whom have reloaded or revamped their rosters in an effort to compete with Miami's small-spread look, as Grantland's Zach Lowe notes -- to catch up and cut short the Heat's run at a repeat. There is no more important asset for a basketball team than talent, and yet the more loaded squad does not always win. What we've seen in recent seasons isn't only that the best team wins, but that the group with the clearest sense of self, from management down through the players, prevails. A team must not only be talented, but sure of its goals, present and future, and the best methods of obtaining them. Most NBA teams have trouble with their identity. Eric Freeman's Identity Crisis is a window into those struggles, the accomplishment of realizing a coherent identity, and the pitfalls of believing these issues to be solved. For a season and change, the Heat's biggest problem was that they didn't quite know what they were, whether in terms of a superstar hierarchy or the basics of figuring out an ideal offensive scheme (related issues, of course). After June's championship, their identity is set: it's LeBron's team, clearly, with Dwyane Wade playing the role of gracefully aging second option and Chris Bosh acting as a sort of star role player. They know what they are, and that makes them dangerous. The Heat's biggest issue, then, isn't necessarily keeping pace with reloading challengers, but making sure that they avoid stagnation. In the offseason, Pat Riley saw that there would be some new blood, albeit in the form of reserves well past their points of peak effectiveness. The Heat are scarier — it'd be difficult for a team with a shooter as good as Ray Allen not to be, no matter his age — but they are also, for the first time in the Heatles era, relatively comfortable. Over time, that could become a problem — complacency tends to be a bad look in a profession dependent on competitive drive. 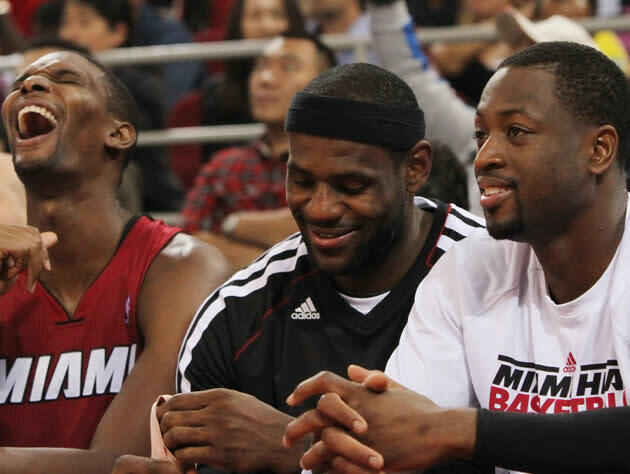 For now, though, the Heat can be forgiven if they relax a bit during the regular season. As ever, they are the hunted. But they're also the kings, and more often than not the ruler of the land can hang back until he deems it necessary to fight.